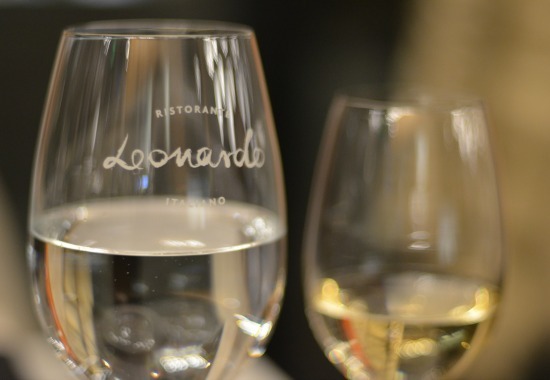 Since the summer, Leonardo’s has been the much talked about new Italian restaurant in Bansko. It’s located close to Lucky Bansko Hotel and has been receiving top Trip Adviser reviews. I was invited there to try it. DISCLOSURE: This is a sponsored article and readers should bear this in mind. But also that I never recommend anything I have not tried, and can genuinely can recommend to you. I drove down and was pleased to find it has its own parking area, so there’s no hassle with the parking – so difficult to find in the Bansko ski season. You enter a very spacious and light dining room. Both my dining companion, Vanya, and I commented on how comfortable the seats are. No cramming you in here for the extra venue to just gain a few extra tables. The staff are professional, smile and all speak excellent English. Then I start spotting details that help to the overall impression that the Leonardo owners really know they are doing. A fresh fish display, proper wine storage cooler cabinet and a separate food bar with a semi open kitchen. At the table, you can see those little touches that show they go the extra mile. For example, the proper bottles of balsamic vinegar and bio olive oil, branded glasses, a list of products causing allergies as part of the menu. 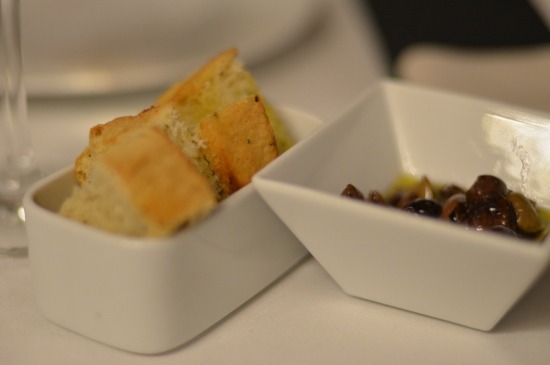 I must comment that the welcome focaccia bread with chopped olives and olive oil freebie was a fabulous idea. Interior is bang on trend – simple and modern, comfortable chairs, nothing to intimidate you. All this makes it very family friendly and not necessarily a special occasion place. I feel I could go there just as easily for an apres-ski bite or casual lunch, as for a more special occasion. The menu totally reflects that concept. A varied, and not too big, Mediterranean/ Italian menu offering a little bit for everybody. Salads, hand-made fresh pasta and pizza, of course, but also the more sophisticated dishes like Black-Angus steak, beef tenderloin with goose liver, skalopini, fresh seafood. Ingredients are listed for each dish in the menu. Prices are fair, and reflect the ingredients: pasta (from 10lv for a simple Arabbiata to 20 lv for Pappardelle with truffles and porcini); pizzas are on a proper thin base and average of 14 lv; meat mains start around 16 lv and go up to 69 lv for the beef steak. I could not miss the focus on organic and the healthy, such as gluten-free pasta and organic/bio ingredients. 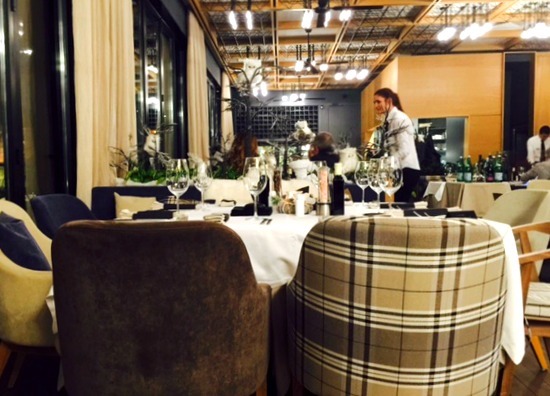 I have received several emails from readers asking about gluten-free and, until now, I struggled to recommend anywhere in Bansko for them to dine. The wine list is extensive and covers all ranges both Bulgarian and International. We had a half bottle of Italian Gavi. Another tick in the box for stocking a selection of half bottles — but be warned these were not mentioned in the menu — so do ask for them if it’s a school night for you. The wine selection and storage makes me think the owner of Leonardo’s bit knows, and cares about, wine. A good selection of fresh salads but I was more adventurous and ordered the Trio di Tonno – tuna fish presented in three ways. 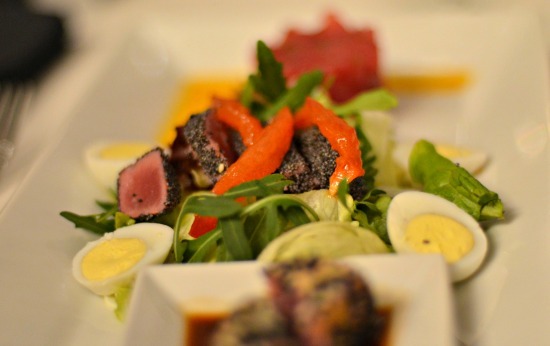 An impressive dish – fresh tuna tartare with capers, chives and lemon dressing; a salad with quail eggs and tuna in poppy and lemon dressing; marinated tuna in sesame seeds. I equally loved the presentation and the taste. Totally worth its price of 26 lv. Anyone who likes sushi, but appreciates some change from it, will know what I mean. If you’re up for something simpler or cheaper – go for the Colorata, Rucola or Burrata salad (12lv – 14lv). It was difficult to make up my mind among the fresh fish and barbecued meats. In the end, I went for the healthy choice of organic chicken (18 lv). 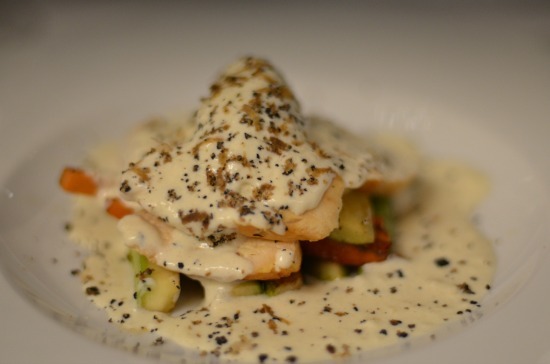 Chicken filets with thyme served with truffle, vegetables and bread sauce. I wanted to compare notes with the chef on the bread sauce, which is something I make at home. All due respect, he does a great job. Tender meat of a free-range chicken cooked just right generously covered in an amazing bread sauce. I cannot fault anything in this dish. 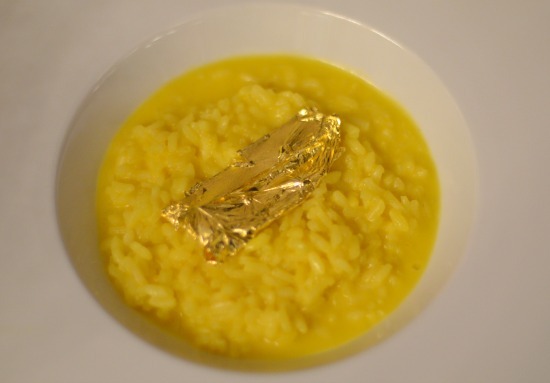 To add some glitter to this review – here is the Risotto Foglia D’Oro – a risotto with saffron and a 24-carat gold leaf. This is a simple white wine sauce and beef broth risotto so go for it if you want something very light and basic. After these lucky choices, I needed to check whether the puddings would deliver. They definitely did. 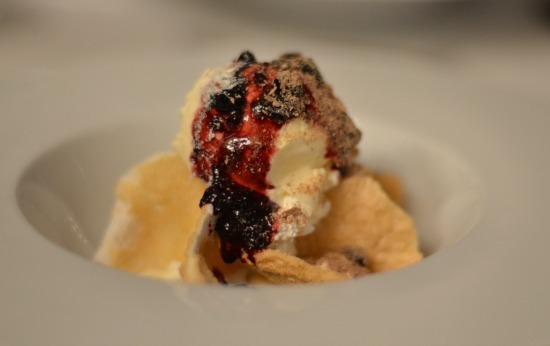 Toscana – crunchy meringue with lemon zest melting in your mouth served with ice cream and flavoursome forrest fruit jam – was just what I like as a proper ending to this wonderful meal. The waiter also recommended the eclair cake topped with creme brulee. 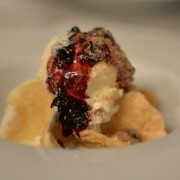 All in all, Leonardo is something that genuinely adds to the Bansko foodie scene. 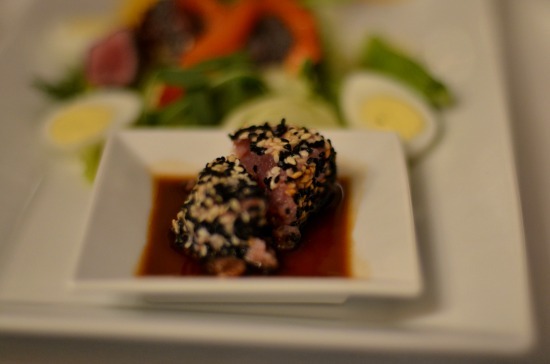 A comfortable, but upmarket feel, quality of ingredients and cooking, professional service, attention to detail. It was full of Bulgarian diners that evening, which is always a good sign for me. It’s hard to fool a local when it some to value for money — and of course there is no tout trying to get you in. The restaurant site says its chef, Gani Pavlov, graduated from the Culinary Institute of Tuscany. I could see the Italian touch in all the dishes I tasted. Leonardo is open all year and I believe it would be an impresive place to visit with the floor to ceiling windows open and the swimming pool just outside. I am more than happy to recommend Leonrado’s. 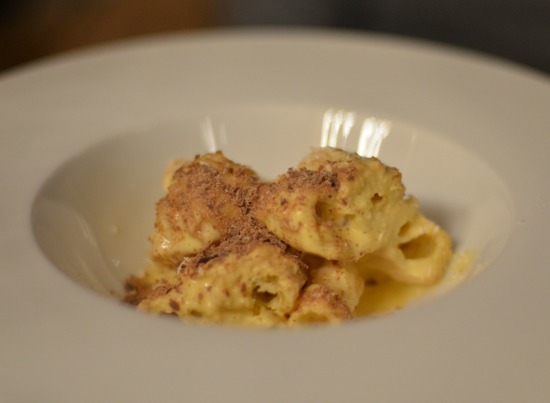 Italian food that is one to try in Bansko. 11 Kir Blago Todev str.